Mention İçmeler to those who know Turkey and the first place that will come to the mind of many is the small, popular resort town, lying on the Southwest Turkish coast, just south of Marmaris. However, when we took a day trip from Fethiye with friends back in March 2010, we were soon to find out that the Bodrum Peninsula also has an area of the same name. The İçmeler of the Bodrum Peninsula was to be our first stop on that day. Our friends work on privately owned boats throughout the summer and had arranged pre-season meetings with some boat owners around Bodrum. We pulled into the boatyard at Içmeler and entered into a shaded world of giant gülets propped on frames, all of which were under varying degrees of restoration and out-of-season maintenance. On finding the gület they needed, our friends hopped up the ladder to the deck and beckoned us to follow. Have you ever seen a gület when it’s out of the water? These are huge beasts that command respect. By the third rung of the ladder, I was fully aware that my head and legs were not going to let me go any higher so I crept back down and opted for photographic exploration of our new found world of gülets. The sun barely poked through these colossal creations (a gület is a sight to behold) and, wandering around with camera, it was easy to imagine what Alice must have felt like when she swallowed the potion that shrunk her in size while she was adventuring in Wonderland. How can a gület look so majestic in the water and yet so imposing on land? We were even dwarfed by the huge piles of chains. Part of an anchor? Something like that. 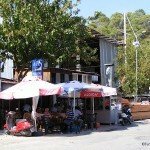 The boatyard in Fethiye has long peaked our interest and we have many photos in the archives – but, on this day in İçmeler, it felt like we had a free pass to explore in-depth where other mortals are forbidden to tread – not that we had any clue what was going on. This was pure craftsmanship in action and we were privileged to witness it. The propellers towered over our heads. These are the mechanisms that keep the gülets so sturdy as they power their way back and forth along Turkey’s Turquoise Coast. It’s no wonder they have to be so huge – we just never imagine their size when we see the gülets anchored in Fethiye harbour. That’s a scene of serenity, not mechanics. Of course, we weren’t completely lost in Içmeler’s massive boatyard. Eventually, further exploration lead us to the seashore, sunshine and back to the real world. We’d left the forest of giant gülets behind. Three years after we wrote this post about İçmeler Boatyard, we finally managed to take a week’s holiday on a Turkish gulet cruise. I went to a boat yard about 11 years ago in that area. I wonder if it was the same one. I was more amazed at the workers because they were fasting at the time and still working hard.They had more strength than me and I was doing nothing!! Already greatly missed out coastline – love your posts and reflecting 🙂 enjoy! In the past, gulets would also be built outside the boat yards, quite a way from the sea. When finished, they would be pulled along the streets to the water on logs, men running constantly from the back to the front of the boat with the next log. The same method that brought stones from Wales to Stonehenge. Of course in those days the gulets were smaller, but it was still an impressive sight. . . now those are some nice photos! Boatyards are one of my favourite place too.